This procedure covers creating a storage pool with an iSCSI target in virt-manager. Open the Storage tab in the Connection Details window. Select a host physical machine from the main virt-manager window. Click Edit menu and select Connection Details. Click on the Storage tab. Press the + button (the add pool button). The Add a New Storage Pool wizard appears. 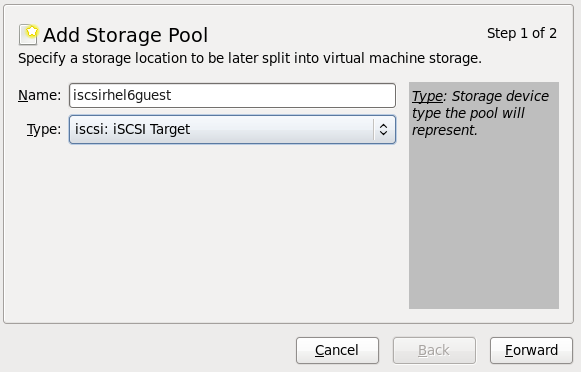 Choose a name for the storage pool, change the Type to iscsi, and press Forward to continue. You will need the information you used in Section 12.5, “iSCSI-based Storage Pools” and Procedure 12.4, “Creating an iSCSI target” to complete the fields in this menu. Enter the iSCSI source and target. The Format option is not available as formatting is handled by the guest virtual machines. It is not advised to edit the Target Path. The default target path value, /dev/disk/by-path/, adds the drive path to that directory. The target path should be the same on all host physical machines for migration. Enter the host name or IP address of the iSCSI target. This example uses host1.example.com. In the Source Pathfield, enter the iSCSI target IQN. If you look at Procedure 12.4, “Creating an iSCSI target” in Section 12.5, “iSCSI-based Storage Pools”, this is the information you added in the /etc/tgt/targets.conf file. This example uses iqn.2010-05.com.example.server1:iscsirhel6guest. Check the IQN check box to enter the IQN for the initiator. 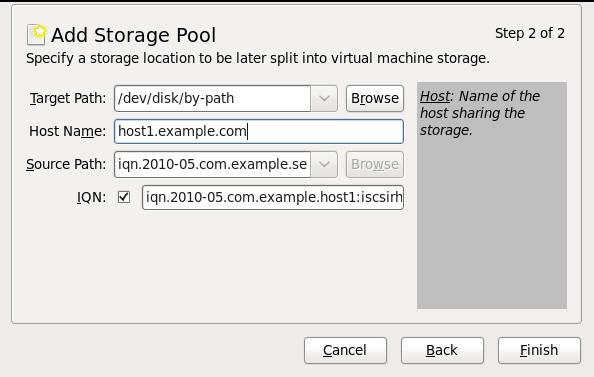 This example uses iqn.2010-05.com.example.host1:iscsirhel6. Click Finish to create the new storage pool.